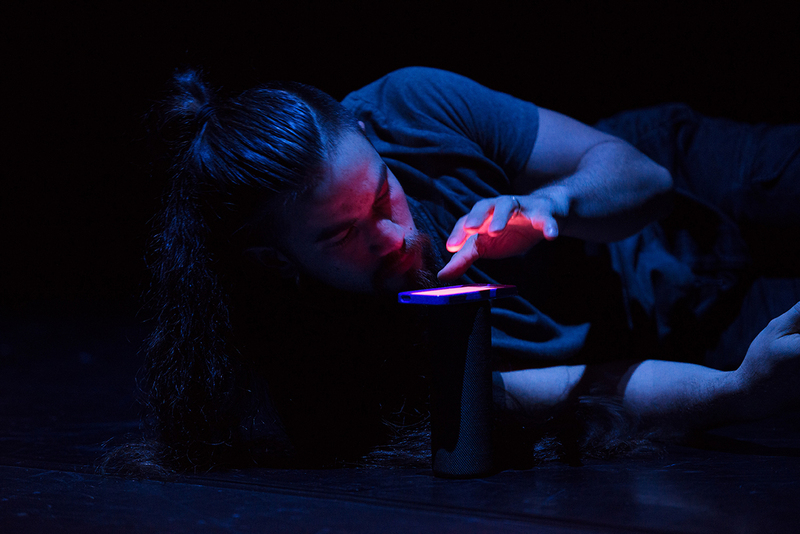 Wireless is a new self-described “polymedia” work from choreographer Lisa Wilson with co-director Paul Charlier using dance and sound to explore the ominous and intrusive nature of the technology that we carry with us daily in our smart phones. It is a bold move for a choreographer and a composer to share a directorial credit and signals that a distinctive approach to the process is being taken — cutting across discipline boundaries in the same way in which digital disruption is unravelling traditional demarcations in the broader culture. One of the most pleasurable aspects of the show is watching Charlier, a highly respected theatre and film composer and experimental musician score the show, from a table placed right in front of the audience. Peering over Charlier’s shoulder, I watch with fascination the interplay between his computer and keyboard and the music erupting out of the phones being manipulated by the dancers onstage. The show sets the primacy of this relationship clearly with the opening image of a male dancer swiping a series of smart phones that have been pre-set on gleaming, low-set silver pedestals. This triggers the sensors within the phones onstage and as the directors’ notes indicate, all the technology used in the show is available from apps that can be downloaded onto our phones. These senors are precise enough to measure the finger taps on our screens and the quality of our sleep. Onstage, the phones augment the dancers’ bodies and intentions. They are activated by the most subtle movements but crescendo with broad arcs of movement, a sonic choreography with resonance akin to a cathedral — a techno-organ that holds some of the dynamism of the performers’ bodies while still sounding like it originated from a smartphone. The dancers (three men and a woman) move through the space playfully manipulating the phones, strapping them within body stockings on arms and legs so that they can extend and problematise the sonic choreography as they push off one another. This first section of the work mirrors the novelty of that first eager encounter that many of us had with our phones. But this initial pleasure darkens very quickly as the unremarkable rectangular black box, which has been sitting sedately on one side of the stage, only notable really for its height, opens unexpectedly. 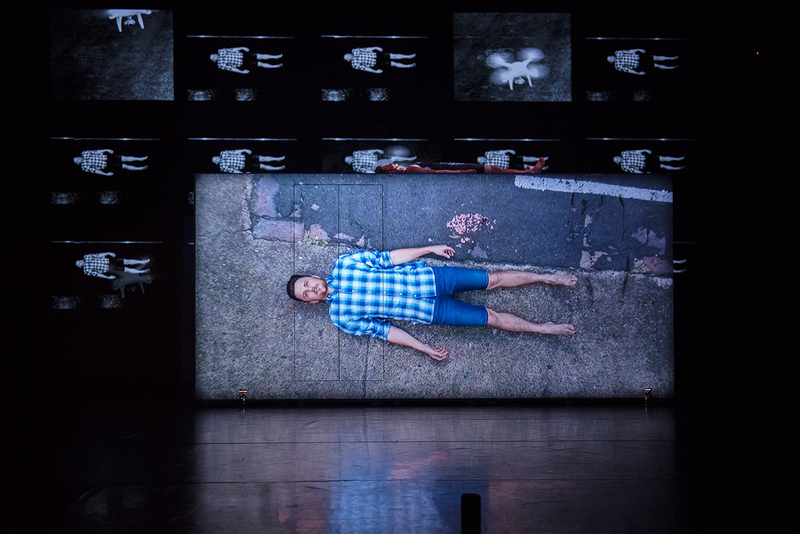 This is the first of a number of small coups de théâtre that use Bruce McKinven’s elegant set and the media elements to recontextualise how we view the interplay between bodies and technology. The box is slid and spun across the room, dismantled and rebuilt, clambered over and used as a perch for dancers to surveille each other. 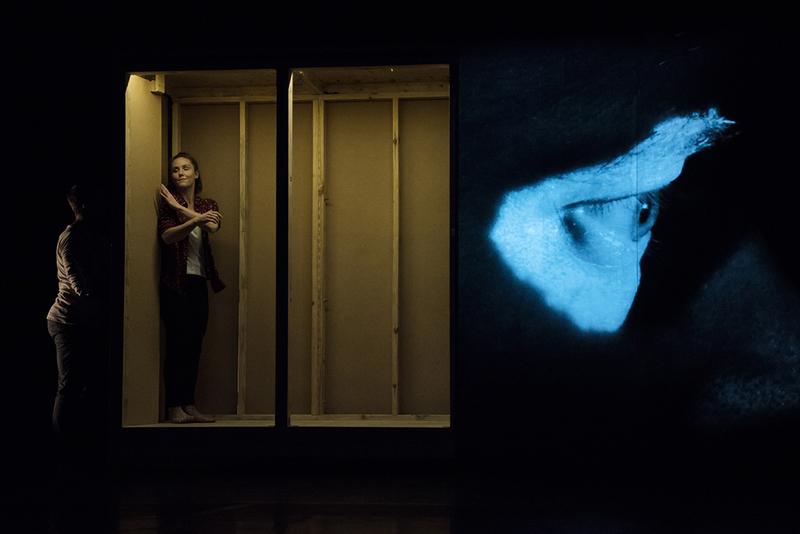 In one of the most eerie sequences in the piece, the dancers add and subtract panels to and from the front of the box, their filmed and live bodies almost interchangeable. The joyous freedom of the handheld technology has been replaced by a monolithic and disturbing entrapment. We are now inside the box, and our agency with these technologies has dissipated. The movement vocabulary darkens as the young woman is handled by the male dancers, security recordings of the city in matrix formation dominate the back screen and the black box is reassembled to become a platform shared by multiple dancers at a time. Wireless provided moments of intense richness and monochrome sumptuousness that literally took my breath away, and the vernacular dynamism of Lisa Wilson’s choreography was, as always, a pleasure. Yet there was a sense of imbalance — to have only a single young female body to three men in this ominous world, particularly where that female is the focus of stalking and violence was a bleak and frightening prognosis; similarly, there was a sense at times that the technology overwhelmed the choreography, making it almost an afterthought to the central mode through which we understand our technological colonisation. In the final and most arresting climatic sequence, one of the dancers lies prone atop the box, like a sacrifice. Meanwhile, we see footage of him projected onto the screen from the view of a rising drone while he lies in the carpark outside the theatre. Again our gaze has been distorted by the technology, and inside and outside slip into the ultimate disembodiment that we are facing with this kind of technology. Yet despite the way the body is disempowered, the grandeur and virtuosity of the image is irresistible.